Last month, the Salt Lake City Department of Airports celebrated Earth Week by acknowledging employees who have contributed to sustainability. The EONS Awards Ceremony (Economic Viability, Operational Efficiency, Natural Resource Conservation and Social Responsibility) recognized employees in divisions across the airport for making efficiencies, repurposing materials, reducing waste, being stewards of natural resources, and supporting the community. High fives and fist bumps for all our employees who help us find efficiencies and help us continually improve our sustainability track record! In the past 12 years the airport has averaged over 160,000 gallons per year of CNG, which equals approximately 45% of our total fuel use for the entire fleet. This has resulted in a reduction of 10,000 pounds in emissions output per year. 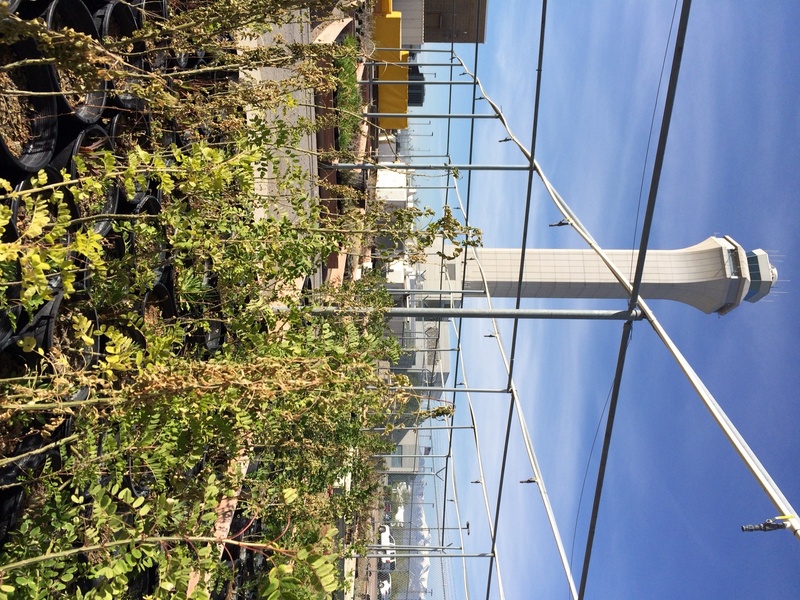 The airport manages its own greenhouse that grows over 6,000 native and drought tolerant plants. Our landscape water conservation plan saves 600 million gallons of water each year. Salt Lake City International has 23 water bottle refill stations throughout the concourses and tenant areas. The stations save approximately 850,000 plastic bottles from going to the landfills each year. LED lights have been installed in runway lighting, tunnels, parking lighting and throughout the terminals. SLC International is also scheduled to release a sustainability dashboard later this year. The dashboard is an online tool that the public can use to see various metrics of sustainability performance at SLC and suggest their own ideas. Salt Lake City’s Terminal Redevelopment Program will build upon the airport’s success in sustainability. Newer, more energy efficient buildings will replace our current facilities and will make better use of natural light and renewable resources. The airport’s redevelopment team is aiming for a LEED Gold Certification for the new terminal. In January 2015, Russ Pack completed his final term of service on the Salt Lake City Airport Board. Russ’ seven years on the board culminates an impressive career at Salt Lake City International Airport spanning over three decades. In 1978, the airport hired Russ as a file clerk until he was quickly promoted as a properties agent three months later. In the years to follow, Russ worked in various divisions and areas of the airport, including Air Service Marketing, Property Management and served as Director of Administration and Commercial Services for 10 years. Russ also served as SLC International Airport’s Interim Executive Director twice; in 2006 and again in 2007 before current director Maureen Riley took the helm. Former Salt Lake City Mayor Ted Wilson (left) with Russ Pack (right) at the airport in 1984. During Russ’ career, Salt Lake City International Airport transformed from a medium-sized facility to a major hub airport. A new parking structure, concourse and an International Terminal were built during a time of rapid change and growth in the aviation industry. Russ credits the foresight of airport staff that acquired adjacent land which accommodated growth and airfield improvements. This thoughtful vision for the future benefits the airport to this day as work continues on the Terminal Redevelopment Program. Russ Pack’s institutional knowledge, experience and passion for the industry will be missed on the board. We thank Russ for his service to the airport and to Salt Lake City and wish him the very best! Today, with the help of the University of Utah cheer squad, Salt Lake City International Airport opened its new entrance to the economy parking lot. The new entrance is approximately 500 feet south of the old entrance, requiring a quicker left turn. The change to the parking entrance provides convenient access to the lot, including the 3,200 additional stalls in the new south parking area and keeps passengers away from the construction to the north. The opening of the new entrance is an exciting milestone for the airport’s Terminal Redevelopment Program, and an enabling project for construction of the new rental car facilities north of the economy lot. Signage is posted and our staff are here to help you find your way. Have a safe flight and Happy Holidays! Salt Lake City’s Terminal Redevelopment Program is now in full swing. Utility work continues in the economy parking area and large, blue cranes to the north now mark the site of what will be the rental car service facilities. These changes are exciting and certainly challenging, yet nothing is more important to us than the safety of our passengers during this project. That is why as of December 2, 2014, Salt Lake City Department of Airports is permanently closing its pedestrian walkway from the Economy Lot. The walking path will cross an active construction zone and will not provide safe ingress and egress to and from the terminals. All passengers must now utilize the Economy Lot shuttle buses, which will provide safe and reliable transportation to the terminals and back to your vehicles upon your return. Several of you have asked us if the walkway will reopen after construction is completed in 2019. Final designs are not complete but initial plans call for a pedestrian access lot closer to the new terminal. Your safety is of the utmost importance to us. To those who prefer to walk, we’re sorry we can no longer provide you with this experience before your flight and appreciate your patience. We can, however, provide you a safe and relaxing experience with our shuttle buses and friendly parking staff. If you’re interested in receiving e-mail updates about the Terminal Redevelopment Program, e-mail us at airportupdate@slcgov.com and we will add you to the list. The holidays have officially arrived this week as passengers make their way across the country for Thanksgiving weekend. While Thanksgiving is a busy time for many U.S. airports, it is not the busiest weekend for us at Salt Lake City International. Nevertheless, this holiday gives us the chance to cover smart travel tips and the opportunity to give thanks to our passengers and community. • The best trips begin before you’ve left your home. Pack as light as possible, place identification on your bags, limit liquids to 3.4 ounces on carry-ons, and leave any gifts unwrapped. Print your boarding pass or save it on your phone. Check the status of your airplane on your airline’s website or smartphone app so you can adjust your schedule accordingly. • Give yourself plenty of time. Guidelines recommend arriving to the airport at least 90 minutes before your departure time for a domestic and two hours before an international flight. If you’re parking here, tack on a few extra minutes. Our new south economy parking area is now open but you’ll want time to familiarize yourself. We’ll have extra staff and shuttle buses throughout the busy weekend to help you get to the terminals and to your gates. • Other resources: Have you considered TSA’s Pre-Check program for future travel? Pre-Check expedited screening is a great amenity for SLC passengers looking for a quicker, easier security experience. More great travel tips and information can be found on the TSA website www.tsa.gov and their handy (and free) smartphone app My TSA. Since you’re a savvy traveler who plans ahead, you may find yourself with a little extra time once you’re here. And that’s okay! Relax, have a drink or snack at one of over 30 restaurants, and enjoy the festive environment and live music throughout the terminals on Wednesday. You may even see our therapy dogs roaming the terminals. Lastly, we are proud to announce that SLC Airport employees donated over 500 pounds of food for its holiday food drive, benefiting the Utah Food Bank. We love the community we serve and are proud to give so that all families can have a great Thanksgiving. For those who call SLC International Airport “home” and for those who are simply passing through, we wish you safe travels and a very Happy Thanksgiving! Once again, Salt Lake City International has been named the #1 airport in the country for on-time departures! This according to a yearly analysis conducted by the Bureau of Transportation Statistics and reported by Travel and Leisure Magazine this month. SLC is no stranger to this title and has consistently received top marks for on-time departures (and arrivals) throughout the years. Many people ask us how SLC maintains its punctual record. A lot of credit is due to our world-class Operations staff that maintains the airfield, plows runways, de-ices airplanes, and keeps the airport functioning every single day. Our dedicated team of FAA employees works to safely and efficiently clear landings and takeoffs and keeps navigation aids working properly. Additionally, we are fortunate to be served by eight airlines that provide reliable service to our passengers and our community. Delta Air Lines, our major air carrier, typically ranks among the top of the list for on-time performance. Salt Lake City’s convenient inter-mountain location, orientation, and geography also contribute to our impressive on-time history. For all these reasons, SLC is glad to own the bragging rights to “most on-time airport” for another year! This morning, Salt Lake City International opened its new south parking area to the public, adding 2,900 spaces to the existing Economy Lot. The opening of the south parking lot marks the first construction milestone for SLC’s Terminal Redevelopment Program that began in July of this year. To commemorate the “soft” opening, we did some reverse trick-or-treating, and gave the first ten customers to park in the lot gift bags, including three days of free parking. We appreciate our passengers and enjoyed the opportunity to give back to a few of those who park and travel through SLC! The new “Red Section” offers state-of-the-art LED lighting, convenient access to the terminals and, as with all our economy parking, includes heated shelters and service with CNG buses. Friendly Central Parking staff members (801-575-2887) are always available to assist you. What is next for Salt Lake City’s Terminal Redevelopment Program? Construction of the new rental car facilities on the north side of the Economy Lot has already begun. Stay tuned for more updates on “The New SLC” right here on our blog. Safe travels and happy flying!